These are OUR BEST DAZE! My husband and I realize that as hard as these day's are, one day we're going to look back on these day's and say "ya know, those were the best day's of our lives!" Our most recent review product came from Crossbow Education. We received their set of Reading Rulers. I had heard about these types of color overlays in the past and wanted to give them a try. My son is dyslexic and supposedly they are beneficial for dyslexia and vision issues. In my opinion dyslexia and visual weaknesses are two separate issues. My son doesn’t have any visual weaknesses, to my knowledge. But, being a mom who would do anything to help her son read better, I wanted to give these a try.We used them a few times but, they seemed to distract him more than anything so we had to set them aside. I really wish they had worked better for his reading issues but they just didn’t. I believe these would work well for a child or adult who had eye teaming or visual strain issues but not necessarily for the child with dyslexia. If you feel that your child may have trouble focusing or suffer from eye strain, perhaps these could work wonders for him. 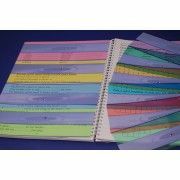 They come in a pack of ten different colors and, according to their website, their purpose is to reduce page glare and dancing or blurring text. They are made of hard plastic and offer a narrow window at the top or a wider window at the bottom. The narrow window would help the older child or adult who is reading books with smaller print while the wider window works with larger print. The cost for all 10 rulers is $16.95 or you can choose a pack of 5 for $9.95. They come in the following colors: pink, celery, sky, magenta, grass, yellow, aqua, purple, orange, and jade. In addition to the Reading Rulers, Crossbow also has a selection of other learning aids such as Phonics Games and Junior Learning Products. Also on their website you can try their Virtual Color Overlay for free. If you’d like to see what other members of the Crew thought of this product, you can read more reviews on this Schoolhouse Review Post. **Disclaimer: As a member of the TOS Homeschool Crew, I received this product free of charge, in exchange for my honest opinion/review. All opinions are mine. For more honest reviews from real homeschoolers, visit the Schoolhouse Review Crew website. 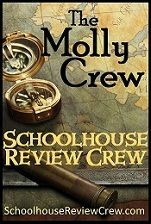 The Schoolhouse Review Crew has a new review team known as the Molly Crew. As a part of this crew I will be trying out products that aren’t necessarily home school related, but rather home life related. Want to learn more? Visit this Molly Blog post. 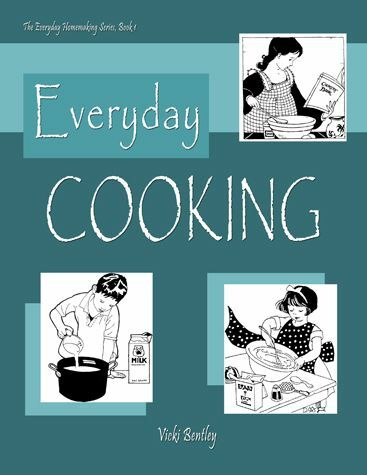 The first product I was given to review was from Everyday Homemaking. They offered our crew two items to choose from, both were books. The Everyday Family Chore System (spiral bound 19.99) or Everyday Cooking (spiral bound 100pages, 17.99 or eBook 14.99) or you can purchase both for $34.98 (this is a sale so I’m not sure how long they’ll offer this price). There are samples on the website so you can check it out before you buy (I ALWAYS take advantage of the samples), there are even some sample recipes! I chose Everyday Cooking. I love cookbooks, probably because I struggle to find something my kids will eat. My husband and my children are simple eaters. They like meat and potatoes. They don’t care for any veggies and they absolutely hate casseroles. They prefer to have their food not touching so it’s best not to “throw everything in a dish and pop it in the oven.” I feel like I cook the same 7-8 meals all the time, over and over. They like it that way, I don’t. I like trying new things, but since it’s 5 of them and only 1 of me, it doesn’t usually go over well when I try. Therefore I always welcome a new cookbook to help me find something to add to my repertoire. Everyday Cooking did not disappoint. Everyday Cooking is more than a cookbook. I would describe it as a cooking manual. There are lots of instructions on things other than just cooking. Such as, shopping, storing food, and multi-tasking in the kitchen. Things that you would teach your daughter (or son) as she works alongside you in the kitchen. Some examples are: how to cook beans by soaking them overnight and how to cook them if you forgot to soak, ideas on freezing meat to make it easy to pull it out of the freezer and have it ready for the meal, substitutions when you don’t have what you need, lots of breakfast ideas to give you a healthy breakfast with little effort, and much more. I found a couple recipes that were easy and my family actually liked (Porcupine Meatballs was one) but what I liked most about the book wasn’t the recipes. It was the tips. There are hundreds of tips scattered throughout the book that teach you things that, if you grew up in the kitchen you probably already know. But if you didn’t grow up in the kitchen, these are basic how to’s that will make your cooking experience so much better. I loved those tips!! The one thing I didn’t like about this book was the tips! Didn’t I just say that's what I loved about this book? Yelp! It was a love hate kind of thing. What I didn’t like about the tips was, they weren’t listed in the index. As I stated before, there are tips scattered throughout the book and they’re usually placed close to a particular recipe where they are most applicable. That’s great. But I had a hard time finding some of the tips later. I’m probably being picky but, I encountered this problem several times. When I first got the book I started reading through it and later when I was ready to cook and wanted to go back and find something I had read, I couldn’t. It was hard to find it because the tips are just scattered here and there. I think they need to be listed in the index so we can find them more easily when we’re not looking at the recipe they’re dealing with. I will say this, they have them in a shaded box so that did help me as I was scanning for a particular tip. Okay so now you know how I felt about Everyday Cooking. If you want to see what others thought of it and Everyday Family Chore System visit the Crew's blog. With our school year being so hectic I chose to step down from TOS Crew this year so I could focus more on the subjects we enjoy and need to succeed in, without having to add in the review products (oh how I love some of those products. I will miss it). So in an effort to fulfill my desire to try new products, I decided to join the Influenster team. I had no idea I would be chosen so quickly (I feel blessed), but I was and I received my very first Voxbox this week. Community of trendsetters invited to share their lifestyles and show off their influence to qualify for personalized product shipments, special rewards and exclusive deals from the brands they love. Members love testing the latest products, giving insightful feedback, and spreading the word on their favorite finds! So over the next few weeks Ill be trying this out and posting my opinion and reading to see what others thought of their items. I've been cleaning out my school material and have added some additional items for sale. If you don't see what you want here, check out TIME TO SALE I have more listed there. I also have a brain training curriculum from Learning Links If you have a child with dyslexia, dysgraphia, dyscalculia etc and you'd like to give brain training a try just make me an offer. This has 4 CD-Rom/DVD's that contain instructions, copies off all the print offs and videos to show you how to do the exercises. have printed off the pages and have them in a binder with plastic covers (they use a dry erase pen to do the exercises). These video’s are recommended for ages 6-14 years (see my opinion below) and last approximately 1 hour each. If you purchase from Library and Education’s website you can purchase them for $8.97 per video or you can purchase all 6 for $47.95 (this is a substantial savings off the original price of $14.95 per DVD and $79.95 for the set). Library and Education is a company I’ve used in the past and value greatly because of the wonderful savings they offer. They have tons of items at a fraction of the cost you’d pay from the original retailers. The suggested age range for these video’s is 6-14 years old but I must say I think 4-10 years old would be more appropriate. My oldest son age 12 didn’t enjoy these at all. My 10 year old was a little more interested but still not truly engaged due to the childlike manner in which they were presented. If you notice the cover of the video, you’ll get an idea of what I mean. Everyone is dressed alike with this cheesy backdrop, almost like Captain Kangaroo from day’s gone by. It’s important to look past these things in order to get the meat offered in these videos. It was just a little harder for my older kids to do that. If you’re kids aren’t used to watching shows like Man, Woman, Wild (one of my kids favorite shows and a far cry from Go Science) then they may really love these. But for us, it was just slightly more juvenile than what they’re accustomed to at ages 10 and 12. My 5 & 6 year olds seemed to enjoy them a little more. 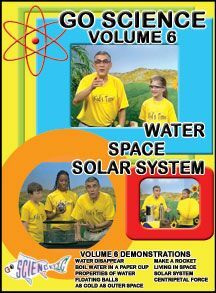 We used these DVD’s as a simple way to expose ALL of my children to some basic Science information. With the younger kids we typically learn Science by following our interests and just picking up facts here and there as we go. This fit in to that way of learning greatly. My expectations were not particularly high so I was not disappointed. The experiments Mr. Roy shared were very neat and he was wonderful at explaining the Science involved. If you want to read more reviews for Go Science and Library Education, visit this TOS Blog Post. **Disclaimer: As a member of the TOS Homeschool Crew, I received this product free of charge, in exchange for my honest opinion/review. All opinions are mine. For more honest reviews from real homeschoolers, visit the TOS Crew website. Tyndale and Focus on the Family have teamed up to bring us another “Busy Mom’s Guide” this time it’s all about Food and Family (two things I personally LOVE). This is a 192 page paperback book with only 6 chapters, making it a quick and easy read or a nice little handy dandy resource guide. Chapter 5 What about Diets, Medications, or Surgery? This book was most helpful to me because it was put in simple to understand terms and, instead of offering an excerpt from every study available, the information was presented quickly and to the point. I learned the importance of reading labels and also what makes foods healthy/unhealthy. I’ve always struggled in the area of nutrition (and I’m sure I will continue to struggle to a point because this just isn’t top priority in our lives right now) but this book has made it a little easier to make the right choices. **I received this book free of charge from Tyndale, in exchange for my honest opinion. The boys enjoyed all of the experiments they watched and they also tried many of them with no difficulty at all. I love that they were able to do most of them with little to no assistance from me (they actually allowed their younger brother and sister be their ‘assistants’). They were quite impressed with what they could do with ordinary items from our house. Our favorites so far are Lift an Ice Cube with a String, Matchstick Speedboat, and Cloud in a Bottle. Jason Gibson is the Science teacher in these videos and he shows you step by step what to do and explains the science behind why it works. You can then do the experiment yourself if you wish, but it isn’t required. By watching the video you will have learned all you need to understand the science, but my kids weren’t happy with just watching, they wanted to actually do the experiment themselves. The video’s are pretty short, about 10-15 min each, as you can see from their demo HERE. Science and Math.com also offers video’s for Basic Math, Algebra, Geometry, and Calculus as well as Chemistry and Physics. I would suggest Amazing Science as a great supplement for any Science program and even a stand alone program for the younger children who really don’t require a lot of science instruction. Visit Amazing Science and sign up for a free experiment delivered to your inbox. 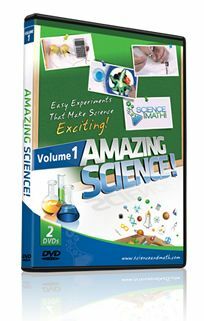 You can also find a list of all the experiments on these DVD’s. If you would like to hear what other TOS Reviewers thought of Amazing Science please visit the blog here. I'm a homeschooling mom to three boys and one very rotten little girl. I love my life and I believe the Lord hand picked my husband just for me! It is my greatest desire to grow in the Lord and to be a living example for my children to see and learn from. I read somewhere that motherhood is the journey from self-centeredness. I knew exactly what that meant my first night in the hospital with that tiny baby that would not sleep. As the years have gone by I've learned more and more how truly selfish I can be. I'm so thankful the Lord has blessed me with children to teach me the art of selflessness. I'm definitely still in the learning phase, but by His grace I hope to finish my journey more selfless than when I began.